The main issue with drilling holes in composite materials is de-lamination of the materials local to the hole when poor breakthrough of the laminate occurs. The best drills for composite materials are either solid carbide or diamond grit depending on the materials in the laminate. Although more expensive, solid carbide can be sharpened and diamond can be re-coated, the effectiveness of these drill bits is best when matched to high speed drills. High speed drills allow the drill bit to do the work and reduce the amount of pressure exerted on the material reducing the risk of poor breakthrough and de-lamination. 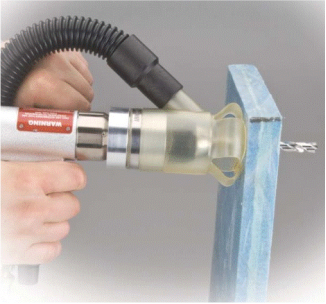 The extracted drill tools are very effective at dust capture at source to make for a clean working environment. Suited to manual drilling of holes, countersinks and counterbores, these high speed drills minimise de-lamination and often do not require the use of a backing structure or back drilling. Ideal for dust free drilling of vertical, sloped and horizontal surfaces and is suitable for production and on-site drilling activities. Using carbide or diamond drill bits with the vacuum shroud provides dust free drilling operations with dust capture at source when combined with our portable dust extractors. Suited to manual drilling of holes, countersinks and counterbores, these high torque drills are suited to thicker laminates, larger drill diameters and small hole saws. 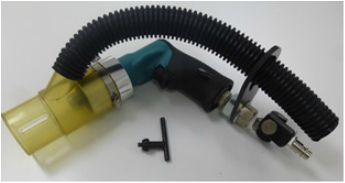 Using carbide or diamond drill bits and hole saws with the vacuum shroud provides dust free drilling operations with dust capture at source when combined with our portable dust extractors. A versatile belt sander that has variable speed and can be used for quick and aggresive material removal through to fine finishing of edge of parts for laminate and sandwich panels. The silica carbide abrasive belts allow agressive material removal from edges. The surface conditioning belts allow for blending and edge finishing depending on the grade used. The belt drive can be removed and fitted with the die grinding head included in the kit to turn the tool into a right angled die grinder that can be used with diamond burrs for material removal. When fitted with the 50mm/2" roloc holder also provided in the kit, it becomes a versatile disc sander. The belt drive can be removed and fitted with the drill chuck included in the kit to turn the tool into a high speed, low torque drill that is suited to drilling holes up to 6mm / 1/4" in diameter with no de-lamination.